Southern Skywatch, the April 2008 edition, is now up. With this issue, Southern Skywatch turns 10! Ten years of monthly sky columns, some late, some very late, but most on time. We have seen Eclipses, occultations, Leonid meteor showers and transits of Mercury and Venus. 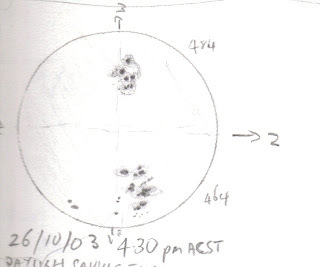 The original inspiration for Southern skywatch started with some occasional sky watching notes I posted to the Australian ABC's "Science Matters" discussion group. Ian Allen of the ABC science online group suggested that I write a monthly web page and the ABC kindly provided some logos and images and a link, and the rest was history. I've had a great 10 years and hope to be doing Southern Skywatch for many more. I' working on some ideas to celebrate this anniversary, so keep tuned! In the meantime, watch the sky. 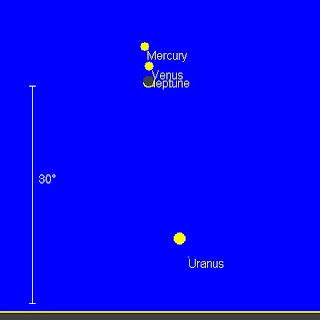 We have close approaches of the Moon, Mercury and Venus. Mars near Mebsuta, the Moon, Saturn and Regulus forming close patterns and occultations of Neptune and Antares! Happy sky watching! I'm going to be doing family things for a week, so I won't be psoting for a while. Talk amongst yourselves and have a great time. Carnival of Space #46 is here. Carnival of Space #46 is here at Riding with Robots. There is coverage of the Lunar and Planetary Science Conference, Moon websites, space elevators and much, much more. Rocket over and have a look. Renowned Science Fiction author, visionary and all round good guy Arthur C Clarke has died at the age of 90 in his adopted home, Siri Lankar. Commentary can be found here, here, here and here. Clarke was one of the big influences of my teenager and young adult years. For me the big three were ABC (Asimov, Bradbury and Clarke, the usual list is Asimov, Clarke and Henlein, but Bradbury impressed me more). I remember reading 2001 and being blown away. I scoured our school library for his books. "A fall of Moondust", "Nine Billion names of God", :The Sentinel" and who cannot read "The Star" without a shiver. Farewell Arthur, the world was richer for you. I don't want to make this all exoplanets, all of the time. But I would be remiss if I did not mention two excellent blogs. Systemic is dedicated to exoplanets, and Centauri Dreams talks a lot about them. As well, there is Transitsearch.org, dedicated to amateurs observing exoplanets, which has numerous resources for doing so. And of course there is the AAVSO exoplanet transit observing program, also with lots of helpful resources to get amateurs observing exoplanets. And the amateur Exoplanet Archive. Walking home with Eldest One from Hindmarsh Stadium, having watched the Adelaide United vs the Chinese team Changchun Yatai fight to a nil all draw, I pointed out the Moon flanked by Saturn and Regulus. He throught it was pretty. Around us thousands of people milled, intent on gaining their cars and getting home, oblivious to the beauty above. Later I shot this vastly overexposed image of the three. 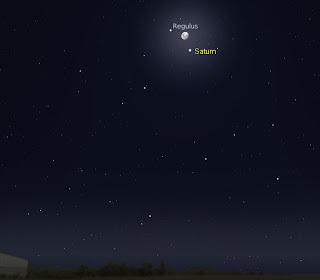 Regulus is to the left, Saturn below right. We have finally broken the record breaking 15 days over 35 degrees C here, and now it is a pleasantly cool 28. Last Friday we escaped the heat by going down the beach. The setting Sun made fantastic coloured patterns on the water, and the Moon overhead added to the scene. But I missed the occultation of Elnath (beta Taurii), due to trying to stop Smallest One paddling into the sunset. I did point out Elnath very close to the Moon to people later on though. David Gee didn't miss it though, here is his video of that event. Just wonderful. 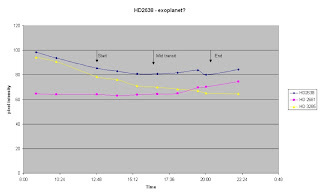 Glenn White of the Rutherford Appleton Laboratory, who is seriously hunting exoplanets with the STEREO SECCHI instruments, kindly provided a link to the HD2638 light curve they generated. No detectable transits. It turns out that the usable limit for exoplanet detection is around magnitude 8, and it's a lot harder than I thought (and I thought it would be pretty hard at that). Still, it is possible, people are working on it and STEREO turns out to be an even more amazing instrument. The north-eastern evening sky on Wednesday March 19 at 9:00 pm daylight saving time as seen from the southern hemisphere. The sky is pretty nice at the moment, with Taurus, and Orion in the north west. As well, there is a bit of planetary action this week. 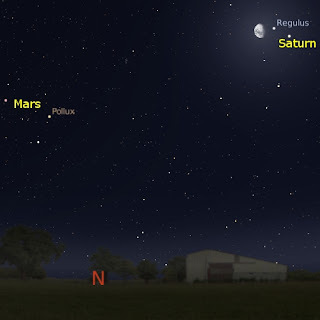 On Wednesday March 19th, The Moon, Saturn and the bright star Regulus will form a close triangle that you can cover with two fingers held at arms length. That will be rather cool to see. And that's not all. In the morning sky, Mercury and Venus will come back together again over the coming week. As well, there is a series of accessible Iridium flares during this week, so check out http://www.heavens-above.com/ for local predictions. You know, I should be setting up the telescope to view the magnificent Moon riding up there in the sky..... If it wasn't 30 deg C out there and any image would be a wibbly-wobbly mish-mash. And the idea of dripping sweat into my optics isn't so cool either. So instead I'm trying to see if I can tease exoplanet transits out of the STEREO SECCHI data. It would sure help if I was at all competent at this. Inspired by an article at the STEREO website on analysing variable stars kindly pointed out to me by Comet Al (and some ImageJ tools he pointed me to), I had another go at HD 2638. This time I used an earlier image set (15-02-08) with less potential interference from CME's (no such luck, the entire star field twinkles regardless of CME's as the stars pass across the CCD surface, there must be a way to normalise this). I also used a broader astrometery field, and also did a background field set on an area devoid of stars to counter for background changes. The results look a little cleaner, but there is still no obvious transit that can be seen above the noise. To get a feel for this look at the graph above comparing an Algol eclipse with HD2638. I processed the Algol data the same way I did HD2638. The Algol data is much more stable, as were the reference stars, but the Algol eclipse depth is enormous compared to HD2638. Oh, where is HD2638's data? Look closely at the zero line, you will see it almost superimposed. So yeah, HD2638 is a hard ask. But looking at the STEREO article it still looks possible, so I will just have to bite the bullet and learn how to do astrophotometery analysis properly. A couple of days ago I speculated that the SECCHI imagers of the STEREO space craft might be able to detect exoplanets. I was really excited by this idea, finding it hard to sleep as the thoughts bounced around my head. I had to try it and see. The star I selected was HD2638. It is moderately bright (magnitude 9.38), has a period of 3.44 days, so several transits could be caught in the H1 imagers, the transits were long enough to get reasonable coverage with the H1 imaging schedule, the transit is reasonably deep (1.2% of the stars brightness) so there was a modest chance that the imager sensitivity would pick this up. 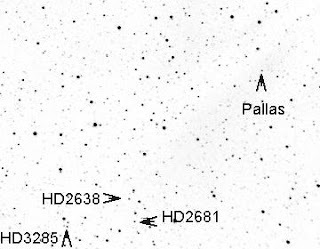 And best of all, HD2638 was in the field of view of the H1A camera in February, when the star was undergoing a series of transits. With mounting excitement, I downloaded an image series that spanned a recent transit. This was frustrating as my internet connection is slow at the moment, and it took over a day to get all the images. Then I stacked, background subtracted, and registered the images in ImageJ, then went looking for HD2638. This was not exactly straight forward, as the field of view images on the SECCHI site is not the actual field of view, the area H1A was looking at was devoid of obvious asterisms and the camera sensitivity means that image star brightness does not match the star magnitudes in SkyMap. But having the asteroid Pallas in the field of view helped. Eventually I tracked down HD2638, measured it's brightness in each frame using ImageJ (it inverted the image to black on white for easier analysis), downloaded them to a spreadsheet and graphed the result. And got a transit like curve (click on the spreadsheet image above for a full scale version you can actually read). I was astonished, this all seemed to easy. Surely it should be harder than that? It was a bit suspicious, the "transit" was wider than the ephemeris predictio0n, and it seemed to deep. So I measured the intensity of a companion star, HD 2681, a 9.2 magnitude star nearby as a control. This curve came out flat. I held my breath. The transiting star drops in magnitude, the non transiting star didn't. This could be an enormous breakthrough. But something didn't feel right, amongst other things, the HD2681 curve implied that HD2638 was getting dimmer when the transit was well and truly over. So I did another reference star, HD3285, a magnitude 9.3 star also close by ..... and got the same curve as for HD2638. It was all instrument artefact. Of course, if I had done a surface plot (see the animation above), this would have been immediately obvious (handy tool that should have used it first). Notice most of the peaks decreasing then increasing. Either the H1A instruments sensitivity drifts significantly, or the way the star images drift over the pixels of the CCD chip mungs up their brightness, or the method I use for background subtraction is inappropriate. I think it might be still worth while having a mores serious look, possibly with a more deeply transiting star if I can find one (possibly HD192263, mag 7.7, 2% drop, but on the margin of being in the H1A instrument field of view). Or I could just ask the SECCHI people. Carnival of Space #45 is here. Carnival of Space 45 is now open for observation from Missy's Window. An accelerating Universe, a mystery at Enceladus, Daylight savings musings and lots, lots more. Pull up a chair and look out. As you know, I regularly download images from the STEREO SECCHI imagers to search for comets. I haven't found any yet, but Comet Al has found one or two (or three). But you can see lots more than comets (and coronal mass ejections) in the STEREO images. Like lots of asteroids. As the H1 and H2 instruments only go down to about magnitude 14 at best, you are unlikely to discover any new asteroids though. Nova too, Comet Al caught this image of Nova Scorpii 2007 near comet McNaught in the H2 imager. And variable stars. The animation above is of the minima of Algol that took place on the 7th of February. Now, this is no big deal for many people, but I have never seen a minima of Algol before (Algol is always too close to my horizon to reliably check it out), so catching it in the STEREO images was something special. 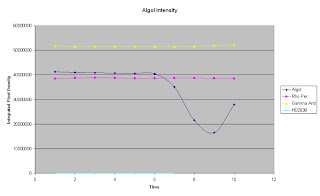 Of course, Algol is old hat and well known, but the STEREO images could be used to monitor other less well characterised variables (or at least harder to follow in my scopes). Also, as these at FITS images, you can quantitate the intensity of the star and its drop in magnitude. Could you use the SECCHI imagers to detect exoplanets? It's a possibility, the exoplanet bearing star has to be relatively bright, lie within the H1 or H2 field of view and have a fairly deep eclipse. WASP-2 and HD 209458 might scrape in under these conditions. HD46375 and HD46375 are within the field of view, fairly bright but have only shallow eclipses. HD2638 is relatively bright (magnitude 9.3), in the field of view of the H1 imager and has a fairly deep eclipse (about 1.2% of total brightness, not to dissimilar to TRES-1's 1.7% fall). Sadly, TRES-1, which has been observed by amateurs, is too far away from the H1 instruments to be imaged. Still, there is so much out there that is caught in the STEREO imaging cameras, on rainy or cloudy nights it's like having your own personal telescope. Of course, STEREO is a research instrument, actually intended for studying the solar atmosphere, so for us astronomers everything else is gravy. So don't go crazy and download huge chunks of data, think about the researchers who don't need their bandwidth hogged by frenzied amateurs sucking down every last image. Remember, play nice, it's due to them that we get to play with such and awesome instrument for free. Astroblog has been rated as excellent in the science category by Blogged, a blog evaluation/accumulator site. I am in such august company as Cosmic Variance, Tom's Astronomy Blog and Centauri Dreams in the top 8 blogs. However, I rated higher than Pharyngula, In The Pipeline, Bad Science and The Loom. Considering that my blog is mostly "oh look up, it's pretty" and the latter are pretty science heavy blogs, one has to wonder. Well, maybe Pharyngula scores lower because of the high political content, but The Loom? Bad Science? Regular blogs that update fairly frequently and consistently that have great writing? I consider myself a reasonable wordsmith, but am I really top 8 material? I think something might be a little skewed in the evaluation. Still, I'll wear my badge with pride. Carnival of Space #44 is here. Carnival of Space #44, the angry Red Planet edition, is over at the Bad Astronomers. Lots of good Mars themed posts over there for you to read. There is the Carnival of Space search tool, avalanches of Mars, getting water for Martian explorers, the first women on Mars (driving rovers no less) and lots, lots more. So grab your Mars buggy and head on over. Mercury is at the top of the image (clcik to enlarge). Moon and Venus from New Zealand. Reader Tony Travaglia sent in this stunning image of the Moon and Venus taken this morning. Tony (from Oamaru, which he describes at the Victorian capital of NZ) used a 1200mm 150cm as a long lens, Canon 300D, 1.6 sec exposure ISO 400. 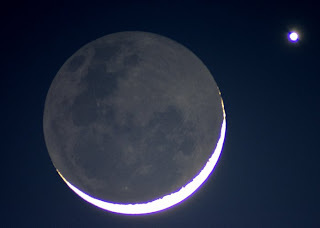 This is a truly beautiful image, the earthshine is captured wonderfully. How was your morning? 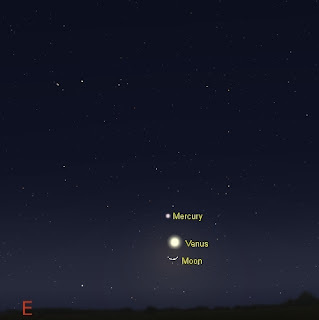 Don't forget, for us southern hemisphereians, tomorrow morning Mercury, Venus and the Moon are close together (the image shows the sky at 6:00 am local time). This will be a great reason to get out of Bed early. With Jupiter up above this lot, the morning sky will look great. Can Polaroid Sunglasses Help You See Venus in the daytime? As those of you who frequent this blog know, I'm a bit obsessed with seeing Venus in the daytime. I recently had a birthday, where I turned 1.03 Chiron years old. One part of my birthday present was a pair of polaroid sunglasses. They are great for getting rid of glare, and I wondered if they would help picking up Venus in the daytime. Now, Venus's light is polarized, but I was hopping the dimming of Venus would be relatively small compared to the dimming of the sky. Nope, not a bit. The polaroid specs DO help though. While the contrast between Venus and the bright sky isn't enhanced, they do reduce the interference from "floaties" the bizarrely moving objects you can see when looking at the clear sky. As these floaters are actually inside the eyeball, there is not much you can do about them, but I found that the darkening of the sky with the polaroids greatly reduced the floaters, and made me less distracted, so finding Venus was slightly easier. On Thursday 6 March Venus and the thin crescent moon are very close, so after watching the spectacle of Venus, Mercury and the Moon in the morning, try and see Venus in the daylight using the Moon as your guide. The above diagram shows Venus, the Moon and the Sun at 8:00 am daylight saving time. 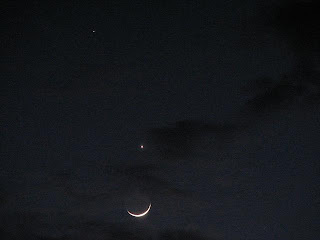 Venus is two fingerwidths above the Moon. It is easier to pick up Venus in the morning when the sky is not so bright. Look for the thin crescent Moon, and Venus should be visible as a bright dot just above it. Make sure the Sun is hidden behind something solid like a building or a wall when you are looking for Venus, not trees or your hand. Exposing your eyes to the glare of the Sun can be very dangerous. These aren't the best conditions. Venus is relatively dim, and fairly close to the Sun , so the sky is relatively brighter. Also, the Moon is only 4% illuminated, so it will also not be that obvious in the sky. Still have a look and see if you can find Venus, it's not often you can see a planet in daylight (and do take care of your eyes). If you miss out, then take a look at this amazing gallery of amateur Venus images, it's incredible! Image Credit NASA/JPL-Caltech/University of Arizona. 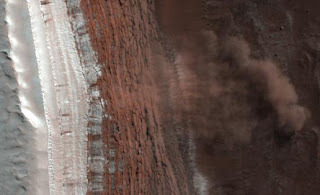 This is amazing, an avalanche on the escarpment of the Martian North Pole caught by the Mars Reconnaissance Orbiter. You can get an abbreviated description at the NASA Science Page, and a full description at the MRO site. If you are feeling active you can dig out the before images and make a comparison with the avalanche images. Tom also has a story on this, as does the Bad Astronomer. The MRO also has a fantastic image of Earth and the Moon taken from Mars. The Bad Astronomer also has a story on that. I've been watching the dance of the Moon and the planets in the morning, but I forgot about the occultation of Nunki by the Moon on Monday morning. Dave Gee didn't and made the video above of Nunki reappearing from behind the Moon. Very Nice. Don't forget Thursday 6th March The Moon, Venus and Mercury are all together in the morning. Microsoft's World Wide Telescope is almost here. 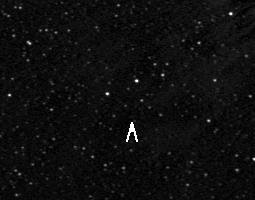 That's it, there, that faint dot just above the really big arrow (ImageJ does have one or two drawbacks). This is Bo Zhou's C3 comet picked up almost simultaneously by Comet Al and Ranier Kracht. Congratulations guys! I found my old observation book! It's been missing for over a year! All my observations from 2001 to 2006 are in this book, the great opposition of Mars, comet Q4 (with a day by day change i nlocation drawn), the transits of Mercury and Venus. Fond memories and vital observations all in one handy A5 package. But, dagnabbit, I just wish my handwriting was legible.